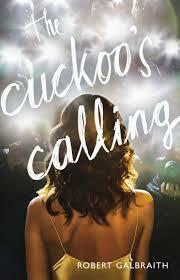 The Cuckoo’s Calling, by first time author Robert Galbraith, was published in April 2013 without much fanfare. That is until it was revealed that Galbraith was actually a pseudonym for J.K. Rowling. There are many reasons as to why Rowling used a pen name for her first mystery novel, perhaps a brilliant marketing ploy? The book went from being unknown to an international bestseller within its first month of publication. There is part of me that wishes I had read The Cuckoo’s Calling before the author’s true identity was revealed, only because the knowledge that it was Rowling heightened my expectations. Fortunately, they were met and I truly enjoyed this engrossing crime thriller. Set in London, England, this book has all of the ingredients of a hard-boiled detective novel, reminiscent of Raymond Chandler’s Philip Marlow mysteries. Featuring a gruff detective with a troubled past (his present isn’t all that great either), his efficient secretary, the tragic victim who dies under mysterious circumstances, and of course many different murder suspects! Rowling is an extremely descriptive writer, and the characters really came alive for me. The book keeps you guessing, and you get to play detective as the author weaves clues throughout the book. I read this book over a couple of days and was surprised and pleased with the ending. The use of a tried and true detective mystery genre, interweaved with the contemporary setting (i.e. the detective asks his secretary to Google different suspects bios) made this book one of my favourite reads so far this year. It might not be for everyone, but it is definitely a must for all mystery and thriller fans! Well done, J.K. Rowling (aka Robert Galbraith) for proving that you can write an amazing adult fiction book. I am eagerly anticipating the second installment. Place your hold on The Cuckoo's Calling today!